Djokovic Wins his first Master’s Cup in Shanghai. In a tournament where all 8 players are close to the same skill level, the winner must have a little luck, a lot of nerve and the physical strength of an ox. Novak Djokovic showed the world that he has the all. He came into the tournament without having won an event since May, and had some doubts about his chances of winning. Ranked as the number 3 player behind Nadal and Federer, he was in danger of being overtaken by the surging Andy Murray, and dropping down to 4th. place if he didn’t play up to his potential. But it was Murray who discovered that playing back to back tough matches was more than his body could endure. The surprise of the tournament must be the play of Davydenko, who with his name cleared of any wrong doing, played some of his best tennis of his career. The doubles winners were Nenad Zimonjic(another Serb) and Daniel Nestor, who defeated the American Bryan brothers for the third time. 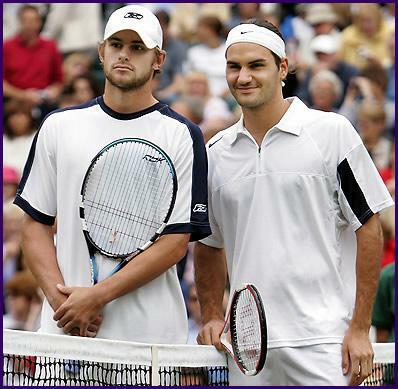 This event brings the 2008 season to a close except for those members of the two Davis Cup teams. 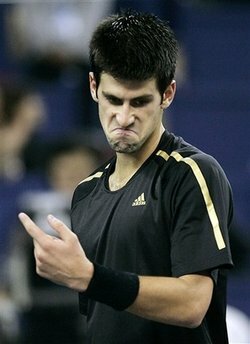 Djokovic will meet Davydenko for the Shanghai Cup! Two players fro m the Gold group survived the semi finals and will play a rematch of their first round match in the Final of the Masters Series Shanghai Cup. 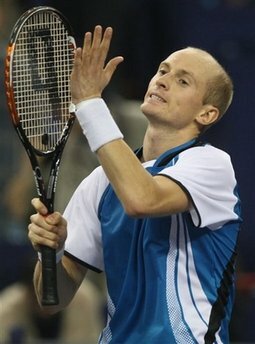 Davydenko showed his old form in keeping the tired Andy Murray behind the baseline with his powerful ground strokes. Murray’s legs would not cooperate with his brain as he tried in vain to work his magic against the Russian, but he could not match the pin point accuracy of Davydenko’s shots. After a close first set it was obvious that Murray was in trouble. He lost his serve early in the second set and never posed real threat to Davydenko who finished him off with an ace on match point. In the other semi Giles Simon looked to be the sharper of the two in the first set, he won 6-4 taking advantage of 21 unforced errors from Djokovic. Novak rallied in the second with a series of patented drop shots that frustrated the Frenchman, and won the set 6-3. Simon’s frustration continued into the third and deciding set, and in uncharacteristic display of temper he smashed his racket into the net. 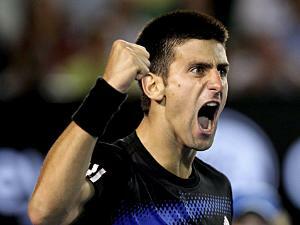 As the match wore on Djokovic took control winning the third set 7-5. Tomorrow’s final between the Serb and the Russian will be their third meeting this year, they are tied 1-1. Davydenko appears to be the fittest of the two, and might just pull an upset. Novak Djokovic’s ready to win in Shanghai. So much has been written about the rise to the rank of Number 3 in the world of Novak Djokovic in 2008, that we tend to forget he is only 22 years old. 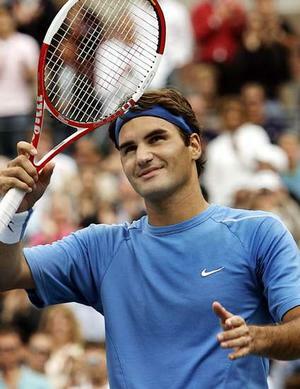 His only Grand Slam win was the 2008 Australian Open where he beat Tsonga in the final and Federer in the semi final. He went on to win two more singles titles at Indian Wells and in Rome. He will face Giles Simon today in the semi final of the Shanghai Masters Cup. He is stronger and more experienced than Simon, and even though he lost to the Frenchman in Paris earlier in the year, Novak should prevail. He is the highest seeded player remaining in the tournament, the only one of the four who has won a Grand Slam, and seems to be being overlooked as the potential winner. He has enjoyed a relatively easy passage through the event so far, and may have more left in the tank than Andy Murray should they meet in the final. Nole as he is known to his family and friends has two tennis playing brothers. Marko who is 17, and Djorje who is 13. Marko played doubles with Nole in the Thailand open last week but lost 6-2, 6-2 to the French duo of Santoro and Tsonga. Novak is not known for his doubles play, he’s actually not very good at all, and maybe its an area he should concentrate on to help improve his net play. Both brothers answered Nole when they were asked who their favourite player was, but young Djorje added that he thought maybe after his brother Ana Ivanovic was his favourite. Smart kid! One thing all three agree on is that chocolate ice cream is their favourite flavour. Since the Beijing Olympics Novak’s name has been linked with that of glamorous Paraguayan athlete Leryn Franco, the former winner of Miss Bikini Universe and a runner up in the Miss Paraguay contest. Novak claims they are just friends, we all need friends like Leryn, but she attended all his matches in China and coincidentally was court side at the US Open. For the past 2 years Novak has been coached by former ATP professional Marion Vajda, and he is credited for much of the success that Novak has enjoyed and the meteoritic rise of his star pupil in the world rankings. Novak has been a fixture at the number 3 position behind Nadal and Federer for much of the 2008 season, and has beaten both of them. He has been criticized for his ‘faking injury’ attitude on court, but it has been revealed by people close to him that he was indeed playing in pain during the US Open. As a young player he has played too many tournaments and too many long 5 set matches, but a win in China would complete a satisfying season for Novak and put him in good stead to defend his title at the 2009 Australian Open. Along with fellow Serbian players Ana Ivanovic and Jelena Jankovic, Novak has become an idol in his home country and an inspiration to thousands of kids who have taken up the game and displaced soccer as the premier game of choice. Federer comes up short against Murray. In an epic struggle to secure a place in the semi final of the Masters Cup, Roger Federer failed to qualify after saving 7 match points against Andy Murray. Serving at 4-5 in the final set to stay alive in a game that lasted more than 16 minutes and had 12 deuces, Roger saved 7 match points to tie the match at 5-5. But Murray took the next 2 games to win the match 6-7, 6-4, 7-6. The win sends Federer home and opens the door for Giles Simon to join Murray, Davydenko and Djokovic as the 4 semi finalists. The Federer/Murray match will go down in history as one of the gutsiest performances we have ever witnessed from Roger Federer. He played through a sore back problem, and a bout of food poisoning to fight for every point in a match that could have gone either way. Federer has won in Shanghai 4 times and is a crowd favourite, but even with the crowd behind him he failed to find a way to beat the vastly improved Brit. Murray is showing signs of being the best player on tour, and if he wins in China, he will be favoured to win his first Grand Slam event in 2009 at the Australian Open. He will play Davydenko in one semi final, while Djokovic takes on Simon in the other. Andy Roddick out of Shanghai Masters. Forced to withdraw from his match against Roger Federer, Andy Roddick was replaced by Czech alteranate player Radek Stepanik. After a close first set that ended in a tie breaker in favour of Federer 7-6, Stepanik just didn’t have enough game to take the second set from the 4 time champion. In a post game interview Federer expressed his concern for his poor play, and said he hoped after a days rest he would feel better and be ready for his next match against the unbeaten Andy Murray. It’s a must win situation for Federer who was beaten by Giles Simon in his first match. A loss to Murray, who has already guaranteed himself a berth in the semi finals, and he is on his way home. Even if Federer squeaks out a win against Murray he has to hope that Stepanik can somehow beat Simon to give him a chance of making the next round. In the Gold group today’s match between Nickolay Davydenko and Juan Martin del Potro will decide who joins Novak Djokovic in the other semi final. The Argentinian fans must have mixed feelings about their player, they would like to see him win in Shanghai but they want him rested and fresh for the Davis Cup final. Davydenko the number 5 player played well enough to win against Djovic, but just failed to do so and might be too much for the young South American player to handle. Del Potro did beat Davydenko earlier this year in a critical Davis Cup match that put Argentine into the final. Shanghai Masters brings out the Best. The final event of 2008 began in China amid speculation that a new face might be on the front pages of the world’s tennis newspapers when this event reaches its last day. Eight players divided into two groups of four will play a round robin, the two winners will move on to the semi finals, and those winners will play for $1.34 million in the final. The gold group is comprised of Novak Jovanovich, Nicolay Davydenko, Juan Martin del Potro and Joe-Wilfred Tsonga. The red group is comprised of Roger Federer, Andy Murray, Andy Roddick and Giles Simon. In the round robin section a player will play all three of his opponents within his group, 3 matches in total. A loss to any of the others forces a player into a position where he has to win both of his remaining matches, if two players are tied in wins then the one who has the best win/loss record in sets will move on. It is possible, though highly unlikely for all players to have a 2-1 win/loss record. The venue in Shanghai is the futuristic Qi Zhong stadium, a hard surface indoor court facility that is quite acceptable to the players. The first couple of days have produced some surprising results. With Rafael unable to play because of his knee problems, there really was no pre-tournament favourite. Federer as the highest seeded player headed up the red group and Djokovic the gold, but it is Andy Murray who is the better’s choice. He won two Masters Series titles in Madrid and Paris, and is playing his best tennis of his life. Day one saw the two rookies in the Gold group, del Potro and Tsonga, go down to defeat to the two veterans Djokovic and Davydenko who are scheduled to play today. Earlier today del Potro defeated Tsonga which almost certainly eliminates the likable Frenchman from the tournament. Giles Simon defeated Federer in the first match played in the red group, while in the battle of the Andy’s, Murray defeated Roddick. Murray will play Federer tomorrow in an early must win situation for Roger Federer, a second loss would virtually eliminate him from the competition. In the other match Roddick will take on Simon, and a loss by Roddick would almost certainly be the end of his sojourn in Shanghai. These eight players who have emerged as the game’s best have much in common in the way they play. Interestingly, the only player to play a serve and volley type of game is Andy Roddick, not in the style of John McEnroe or Stefan Edberg, but he continually rushed to the net as he tried to disrupt Murray’s game. Baseline shot making, court coverage, low risk tennis seems to be the order of the day for all the successful players. Short returns provide easy winners for the opposition, and these professionals miss few opportunities to put the ball out of reach. Full coverage of this event is being shown on TV. In the above picture, Andy Roddick is conspicuous by his absence, I guess he was busy somewhere else, or maybe he doesn’t own a gray suit. Tennis Masters Cup in Shanghai. The futuristic Qi Zhong stadium in Shanghai will once again be the venue for the 2008 season ending Tennis Masters Cup. This event wraps up the season for the men players in a 2 group round robin format to determine the winner, and in some ranking systems determines who is Number 1. Eight men will compete in singles, and 4 pairs will compete in doubles. Accumulated points throughout the season are the determining factor for qualification, these points are awarded for the four Grand Slam events and 9 other ATP tournaments plus points for certain International tournaments. Four singles competitors have qualified to date and the race is on to see who will fill the other 4 places. Del Potro is just 2 points behind Blake for the 8th. Position, and could displace him with a win in Tokyo or Madrid in October. Federer is the defending champion, he has won 4 times in the past 5 years, only losing to David Nalbandian in 2005. This year is expected to be a different story. Rafa is now Number 1, and has shown that he can play on hard courts almost as well as he plays on clay. Both Djokovic and Murray have lots to prove, and either one could ‘get hot’ and win the $1.2 million prize. The Tennis Masters Cup concludes the official 2008 season, and sets the stage for the first Grand Slam event of 2009. The players have a well deserved rest and start preparing for the 2009 Australian Open in January. Tickets for the Shanghai Cup are expensive. A series ticket for a good court side seat will cost $4800, a ticket for the series located in the bleachers costs $2200, but everyone is assured of witnessing the 8 best players in the world and every match will be as good as any tour final. For the players it is a gruelling tournament, the winner will play 5 matches in 7 days, and unlike regular events or even Grand Slam events where the top seeded players often have relatively easy matches in the first rounds, here every match is tough. For the first time in 5 years there is no odds on choice to win. Rafa is the Number 1 player, Federer is the defending champion, and Djokovic and Murray have shown that they can both beat the top two players. Last year’s runner up was David Ferrer, don’t count him out, and if Del Potro makes it to this select group, he could win it all. Maybe Roddick will finally get his act together and make history, and now that Davydenko has been exonerated for betting he might be ready to concentrate on tennis again. It is shaping up to be the greatest finale ever. Let’s see, tickets, hotel, air fare, food, a little entertainment and a couple of souvenirs, I think $20,000 should cover it!